The USGS 3DEP elevation products from The National Map are the primary elevation datasets available from the USGS. These elevation products are continually updated by the USGS with LiDAR collected through the 3DEP program as part of the National Enhanced Elevation Assessment. Imagery services of these elevation products are also avalable. The AGRC has a statewide collection of the 10 and 30 meter bare-earth DEMs. This dataset was reprojected to UTM NAD83 Zone12 meters. The vertical datum is NAVD88. The boundaries of the elevation models can be viewed in the 10 meter and 30 meter tile index shapefiles. For information about working with elevation data in the Pro/ArcMap environment take a look at Working with Mosaic and Reference Datasets. What is the vertical accuracy of the seamless 3DEP DEMs? Light Detection and Ranging (LiDAR) elevation data is an optical remote sensing technology that can measure the distance to, or other properties of a target by illuminating the target with light often using pulses from a laser. Currently this is the most accurate elevation dataset AGRC has but it is only available for some areas of the state. In addition to the bare-earth DEMs/DTMs and first-return DSMs, most LiDAR data also has point clouds available by request from Rick Kelson from AGRC at RKelson@utah.gov. 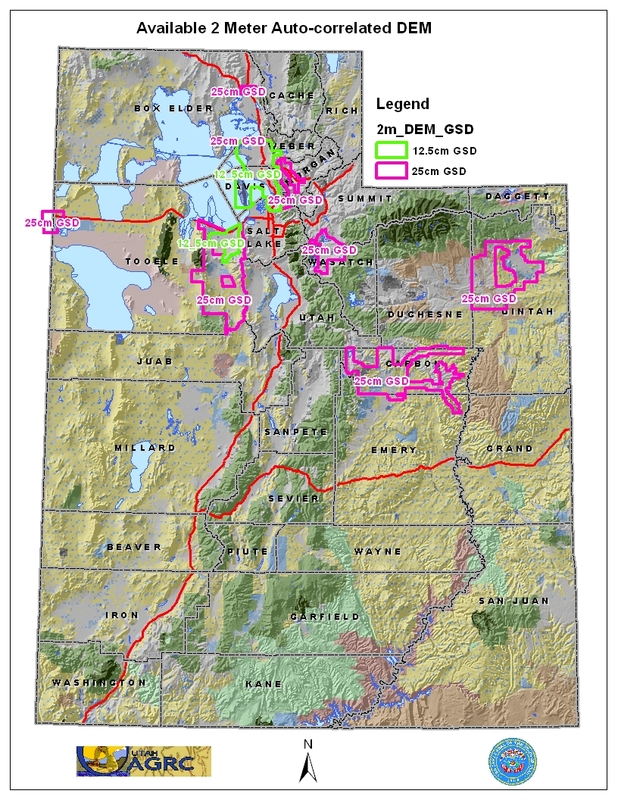 Visit Raster.utah.gov to explore all available LiDAR collections. For more information about LiDAR visit Exploring LiDAR. AGRC has partnered with different agencies over the years to acquire LiDAR data. AGRC has a statewide coverage of 5 meter Auto-Correlated DEMs in addition to some 2 meter areas. The DEMs were created from the imagery collected during the 2006 NAIP and HRO aerial photography flights. The auto-correlation process is not as rigorous as other methods of elevation modeling such as photogrammetry, lidar mapping, radar mapping, etc, and therefore end-users should be aware that anomalies are expected within the elevation dataset. In comparison to the USGS DEM datasets, the 2 and 5-meter DEMs in some areas provides higher resolution and horizontal accuracy but anomalies are present within the data. The DEM files are stored as .asc formatted files and are ~10MB per 2,000 X 2,000 meter block. This data is in a UTM NAD83 meters projection. The 2 meter DEMs have a Vertical Accuracy of RMSE 4.27' - NSSDA 95% 8.4' and a Horizontal Accuracy NSSDA, radial RMSE of 4.4', 95% confidence 7.6'. The 5 meter DEMs have a have a Vertical Accuracy of RMSE 4m - NSSDA 95% of 9.8m and a Horizontal Accuracy RMSE 3m, NSSDA 95% of 5.2m. For more information about the stated accuracy of the datasets please refer to the metadata and quality assurance reports below.